"The island of Jamaica can be divided into three main types of land forms: the central mountain chain formed by igneous and metamorphic rocks; the karst limestone hills in the Cockpit area; the low-lying coastal plains and interior valleys. Limestone formation occurs all over the island, but especially in the western areas". 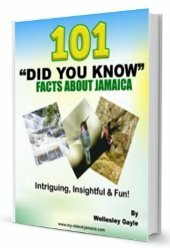 (discoverjamaica.com). Take a look at my Rivers in Jamaica and Mountains in Jamaica for more. For a complete overview, see this page on discoverjamaica.com.